USA Today: "one of the best and most ambitious films of the year"
"The Place Beyond the Pines is a sweeping look at fateful decisions and their lasting reverberations. A riveting crime thriller, it's also a multi-generational familial saga that approaches Greek tragedy. This gorgeously photographed, wisely crafted and somber drama (* * * ½ out of four; rated R; opens Friday in select cities) proceeds in unexpected directions, which makes it all the more engrossing. It's one of the best and most ambitious films of the year. In addition to being beautifully directed by Derek Cianfrance (Blue Valentine), this layered drama about fathers and sons is brilliantly acted." What Culture: "easily the best film of the year"
"Each arc is an ambitious, hypnotic ride with Cianfrance’s thunderous, thumping score. Mixing family drama with crime urban thriller, David Cianfrance cements his status as an up and coming filmmaker with hubristic ambitions, putting him up there with Jeff Nichols and Nicolas Winding Refn. 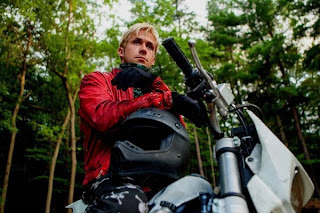 This type of craft and creativity has become few and far between as of late this time of year, making “The Place Beyond the Pines” easily the best film of the year so far." The Atlantic Wire "The Place Beyond the Pines' is a stunner"
To say anything about what transpires between AJ and Jason, and between their fathers, would be revealing too much, but know that by film's end Cianfrance and his company have painted a gloriously rich and moving picture of regret and legacy, of parents failing their children while trying, at all costs, to do just the opposite. ...... At the film's graceful and heartbreaking end, I had the feeling of having finished a good book, putting it on my lap for a moment, not wanting to leave its world just yet. It's not terribly often that your heart aches not just at how a movie ended, but that it ended at all. "Ryan Gosling and Bradley Cooper have proven their box-office mettle over the past few years but what about Derek Cianfrance? The indie director, who astonished audiences in 2010 with his debut feature "Blue Valentine" starring Gosling and Michelle Williams, is becoming a box-office brand in his own right. This Easter weekend the 39-year old director dominated the new releases at the specialty box office with his sprawling 15-year epic "The Place Beyond the Pines." Opening in just four theaters in New York and Los Angeles, the film earned an estimated $270,184, for a per-theater average of $67,546."